Note: DVDs are no longer available. All programs are now online in our new membership area Eldergym® Academy. “I have already purchased these DVD’s, and they are GREAT. I wanted something to get my very sedentary 77 year old husband moving and stronger. I’m 64 years old, and although the exercises are much easier for me, I can definitely feel the benefit! We try to do them regularly along with an indoor walking DVD. “I’m a certified personal trainer. I work full-time as a personal trainer; and I also work extra hours at a local Senior Center, helping the Center’s members learn how to use the exercise equipment, and write them exercise programs. I have had a few requests lately for balance exercises; so I have spent a few hours lately looking for documents and pictures I could print-off for a few of our members. I just wanted to send your website a big THANK YOU for the Eldergym Ebook. I have downloaded it and printed several pages of the balance exercises so our members will have a reference for those exercises. Thank you SO MUCH for publishing the ebook and allowing others to download it for use. Speaking as a professional in the fitness field, it is concise, clear, safe for use, and visually helpful. “My mother is 92 and has dementia. She uses the exercise DVD as her physical activity as she doesn’t get around much anymore. “I already sent a testimonial, but I’ll repeat…..anyone concerned about staying active, or getting back some better function should invest in these DVD’s. I omitted buying the endurance one because we already have an at-home DVD (Leslie Sansone ), but now I’m wondering if my husband would like the Eldergym one better (not so many “hard-bodies” showing off their stuff! )Still might get it! “I recently joined a gym and the trainer who was showing me how to use the machines was impressed with my endurance and flexibility. “Doug makes the workouts fun! He is truly a master at functional fitness which is what we need as older adults. “One of the DVD’s would only play for 7 minutes and then stop. giving me encouragement and telling me exactly what to do step by step. the simple props make learning the exercises easy. Wonderful information! I’m 69, have finally admitted to myself how sedentary I am and how much I need this kind of workout, and just started using some of these exercises yesterday and doing between four and eight reps of each as that’s all I can manage because that’s how limited I’ve become. Thank you and bless you for being so generous and putting these workouts out there for free so regardless of the financial limitations so many retirees have, we can all get more fit and healthier as we age. You have pulled together a beautiful page for elder citizens to learn exercises to keep them functional and vital. This is a wonderful service you have provided for the world community. I am a personal trainer and have reviewed some of your links for best balance exercises and best stretches, etc. Very nice. Thanks. These will help me compile exercises for various individuals. Just wanted to commend you on your great website, it has been a good resource for me as a new occupational therapist. I like how most of the exercises come in the ‘printer friendly’ format. I have been severely deconditioned for about 2/12 years due to cancer surg., anemia, asthma, and the list goes on. Yours is the first program that has made any sense or given me any hope of being able to accomplish it. I keep being sent to PT programs that I cannot do. Hi Doug ,I want to thank you again for your wonderful dvds. My mom has used all of them. Arm strengthening is her favourite. She has been doing it for one year and her arms can stretch high without bending now. It benefits her whole body tremendously. We cannot be happier. Thank you from the bottom of our hearts. Thank-you for the free download of your valuable resource, it is most generous of you. I am a retired nurse, and have always treasured being independent and physically active. I now have instability with my gait due to a left knee effusion and a calcium deposit in my right knee, where the tendons meet the kneecap. I have experienced moderate pain, stiffness and swelling in my knees for the past three months, upon walking but especially when navigating stairs downward. Once the knees are out of alignment, it affects the support structures, muscles and feet as everything works together in mobility. I have been attending physio and massage therapy, but I am really looking forward to using all your exercise programs, because I can see the benefits and hope to gain them with your holistic approach. 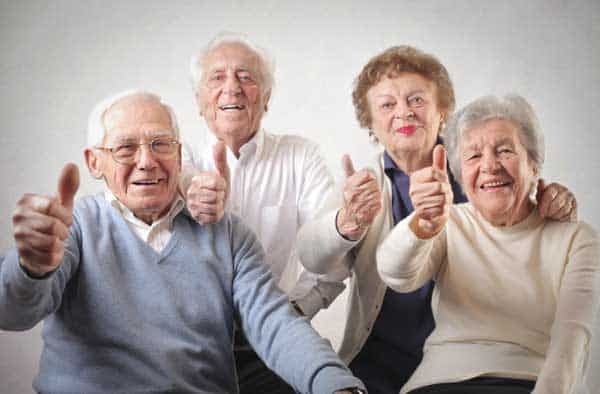 Cheers to you and all those seniors you are supporting in “Healthy Aging”. God Bless! Glad I came across your video. Started out in a gym which I think was too rigorous since I am recovering from spinal surgery. I like how you focus on seniors and their ability to keep at this with no pressure. Thanks so much! it is amazing how little incremental work is getting me back to life. I really appreciate your work. Thank you for your help. Your simple basic strength building exercises do work. I have seen amazing results in just one month doing the exercises 3 to 5 times a week. For anyone on here it takes time and patience but the results are worth it. Exercise is so important. I recently had a crazy slip and fall accident and came crashing down on my right hip. Scary, since my right hip is arthritic. But it’s been a couple of weeks and not a sign of any damage. Exercise works. I have been doing it my entire life.Thank you for your valuable website. Doug…your site is helping my life. I was always strong as a bull..a jogger, athlete, etc. One day, at around the age of 62, I lost every ounce of strength I had. One doctor sent me to the next specialist then to the next. Of course insurance barely covered anything so I quit and took matters into my own hands. I changed my diet of junk food and low fat to no grains, sugar or processed food and added fats. It’s been slow but my job keeps me going and over the past 4 years I have been slowly regaining my self. Your strength exercises are great. Thank you for sharing. I just found them but I can see they will be very helpful. Thank you. Thank you. Thank you! I’m 65 and have had many falls lately. In the street, at the clothesline, climbing stairs …its scary. These exercises look easy and not too difficult… I have started today…will let you know how I go. I was looking for a site and found yours.I think you have the answers to my problem.I have a personal therapist online. I just found your site and am so glad I did! I’m only 61 but a series of surgeries and a husband who won’t walk because his neuropathy is too painful, have given me excuses not to exercise. Plus, it’s boring and makes me sweaty ? But I think your website, the ebook, and knowing I’m not alone, will get me back on the right track. Thank you so much! These exercises are a godsend. They are so perfect and all encompassing! The format and videos are so user friendly and easy to refer back to over and over again. I am a PT and I use these over and over again for my patients for balance and as part of a Vestibular rehab program. First of all I appreciate you for sharing this valuable and unique book. I am a nurse, PhD student in nursing. I am working with burn patients and last night I was searching about ROM exercises for a 24 year old man with knee contraction. It was completely by chance that I saw your unique book. I couldn’t believe that I can have it by your kindness. Thank you so much. I just found your website yesterday. I needed something new for a home care patient for standing balance. I must say, this is the best site I’ve ever found. The videos along with pictures and explanations of all the exercises is just wonderful. I will be referring my fellow therapists to check it out. It’s great for families that are caregiver’s as well. Thank you! Hi Doug! Thanks for the new ebook; it looks great. Love the way it is organized for easy use. I wanted to tell you that I have lost 50 pounds in the last two years using the DVD exercise tapes I ordered from you, and that’s only part of the story…my energy, sleep, digestion, and outlook on life have improved tremendously, to the point that (at 77) I take no prescriptions meds at all, and only see my doctor for annual checkups. Thanks for all that — your DVDs made and are still making all the difference. By using the DVDs 3 to 5 times a week, I have lost several dress sizes, but still need to lose that last ten pounds to get down to my goal weight and goal size. Keep up the good work — thousands of us seniors are benefitting from it! Am still working on my left shoulder and it is slowly getting better. Finally got through all the 90th Birthday parties and newspaper photos. I impressed a lot of folks with my ability to get up out of a chair with no arms on the chair. My younger friends were most impressed. Am slowly doing the 4 week course but not sure I will ever get through it all…But am learning so much I thought I could never accomplish. Have wet macular degeneration and have to go there Tuesday for my 2 month eyes checkup. Always something, but am so happy at the progress I am making in your 4 week course .. I’ll try and stick with it and let you know when I get there. Local hospital want’s me to take rehab for my balance and will see my physician in 4 weeks to see what he wants me to do. I think he will be so impressed with what your course has helped me do. Hello, I would like to add that Physical Therapists are highly skilled to assist elderly with tailored activities to safely improve balance as well! I work as a home health physical therapist- and I do incorporate many of the referenced exercises in my treatment programs…in addition to further education and challenges unique to every “senior” (and all age groups) needs. Talk to your doctor about referrals to home or outpatient physical therapy referrals. I am glad I found this site- it is a GREAT place to start and an excellent reference for all! Thanks Katie. Yes, physical therapists are highly skilled at designing individual functional exercise programs for seniors. On this site, I tend to wear my “senior fitness coach” hat rather than my “physical therapist” hat, but I certainly recommend visitors see a licensed physical therapist when appropriate. I continue to work as a hospital inpatient therapist and recommend home physical therapy whenever patients go home to continue to improve their mobility and strength.